It was cloudy and windy, but I wanted to go out and try to cast the baitcast reel my son got me for christmas. Apparently there is a knob near the handle that must be turned to stop the spool from going in reverse. I got a bass on, and could not reel it in. The fish finally threw my spinner bait. The bite was slow, so I decided to practice casting overhand, underhand, and sideways. I backlashed the spool around 15 times, but finally got the hang of it. I was trying to slow the lure down using my thumb, but that was just causing a bunch of problems. I kept my thumb off and just waiting till the lure hit the water to start winding. I threw close to some weeds and got a giant bass to hit my spinner bait. The fish was in less than a foot of water. The fight did not last very long, since I had on the 15lb braided line. Released him after a quick pic. I did notice around twelve redears bedding up on the northwest side of the pond. I didn’t feel like walking back to the car to get my road runners. Saw two more small bass in the grass on the east side, but couldn’t get them to bite. 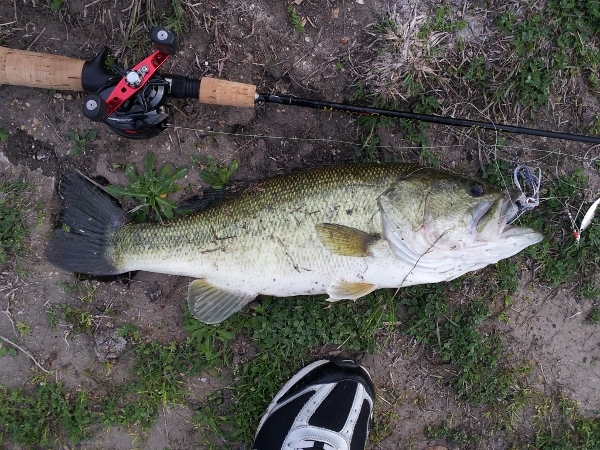 This entry was posted in Bass by joebeasley. Bookmark the permalink.